This standard reference covers the sources, manufacture, specifications, chemistry, physical properties, and current and potential uses of gums. It provides an outline of gums and their uses as well as an understanding of why gums behave in different ways, giving the reader an ability to select the best gum for a particular purpose. Chapters have been constructed to provide balanced information and chapter authors have been selected because of outstanding competence in their specialized areas. Industrial Gums is a useful reference for students and industrial researchers and engineers in chemical, industrial, and applied engineering, biochemistry, food technology, materials chemistry, pharmaceuticals, and biopolymers. Chemical engineers and students of industrial and applied engineering, biochemistry, food technology, materials chemistry, and biopolymers. R.L. Whistler, Introduction to Industrial Gums. I.M. 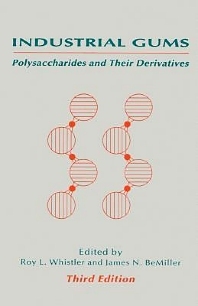 Dea, Conformational Origins of Polysaccharide Solution and Gel Properties. G.A. Towle and R.L. Whistler, Chemical Modification of Gums. I.W. Sutherland, Biosynthesis of Extracellular Polysaccharides (Exopolysaccharides). H.H. Selby and R.L. Whistler, Agar. K. Clare, Algin. G.H. Therkelsen, Carrageenan. H. Maier, M. Anderson, C. Karl, K. Magnuson, and R.L. Whistler, Guar, Locust Bean, Tara, and Fenugreek Gums. J.N. BeMiller, R.L. Whistler, D.G. Barkalow, and C.C. Chen, Aloe, Chia, Flaxseed, Okra, Psyllium Seed, Quince Seed, and Tamarind Gums. C. Rolin, Pectin. R.L. Whistler, Hemicelluloses. R.L. Whistler, Exudate Gums. K.S. Kang and D.J. Pettitt, Xanthan, Gellan, Welan, and Rhamsan. A.N. DeBelder, Dextran. T. Harada, S. Sata, and A. Harada, Curdlan. Y. Tsujisaka and M. Mitsuhashi, Pullulan. G. Brigand, Scleroglucan. J.A. Grover, Methylcelluloses. A.J. Desmaris and R.F. Wint, Hydroxyalkyl and Ethyl Ethers of Cellulose. R.L. Fedderson and S.N. Thorp, Carboxymethylcelluloses. J.N. BeMiller, Starch-Based Gums. R.L. Whistler, Chitin. J.K. Baird, Analysis of Gums in Foods. Chapter References. Index. James BeMiller is Professor Emeritus of Food Science at Purdue University, as well as being the Director of the Whistler Center for Carbohydrate Research. He has had a long and distinguished academic career having published over 150 academic papers, with a strong focus on starch and carbohydrate chemistry research. At various times he has sat on the board of the American Chemical Society, the American Association of Cereal Chemists, Institute of Food Technologists, American Institute of Chemists, and the International Union of Biochemistry.